When positioning your company, it is a good thing to think about this dilemma and decide what kind of projects you want to work on. But as the saying goes: choosing is losing. 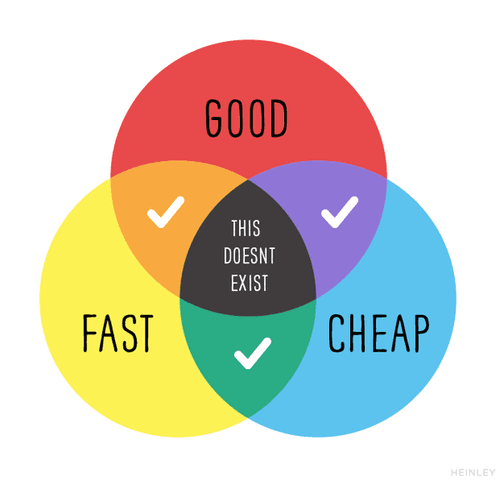 A simple model you can use to think about your web design or development business is the Good/Cheap/Fast model, based on the Project Management Triangle. There are three goals you can strive for: being good, being cheap, or being fast. But you can never deliver all three. If you take on a new project, you’ll have to make a choice. If you want to deliver your websites fast, it means you’ll have to cut corners somewhere else. That’s either going to be on quality,because you can’t deliver a detailed design when you have less time, or costs, because you’ll need to bring extra help or resources to the project. If you want to deliver a project that’s good, you’ll also have to make compromises. Either on costs,by bringing people on board with better skills or experience, or speed, because you need a lot of time to finish every little detail of the project. If you want to deliver affordable websites, you’ll have to choose between speed, because you work on the project during off-hours, or quality, because you have to keep the website simple and less detailed. Many beginning web design and development studios make the mistake of aiming to be all three. But that’s simply not possible. There’s always going to be a trade-of between the three variables. Unless... you’re willing to compromise your own profitability. The good thing is that each combination comes with a specific segment of websites and clients. Choosing what kind of projects you’d like will help you focus when trying to find new clients for your web design business. For example the combination Good & Fast will apply to high-end projects with large budgets. So you’ll need to look for clients that want top quality work delivered fast, but for whom budget is not a concern. The Web Designers’ Dilemma doesn’t mean you’ll be awful at the feature you didn’t choose, because eventually you’ll be able to optimise it as well. With experience, new tools, and automation, you’ll be able to get better, faster and cheaper in time. Sign up for a live product webinar and discover how SiteManager can help your business grow.